Apartments Daria is located in Rovinj, just a 5-minute walk from the Old Town. The nearest beach can be reached in 5 minutes. Restaurants and bars are about 50-100 m from the property.The colourful Rovinj’s Old Town features narrow streets, crowded houses and small squares, while the main street Carrera is lined with shops, galleries and boutiques. The main bus station is 400 m from the apartment, while the airport of Pula is 35 km away. All units in the Apartments Daria are air-conditioned, features free wi-fi, sat tv and have terrace or balcony with sea or garden view. The Apartment Window offers a comfortable accommodation for 4-5 persons. 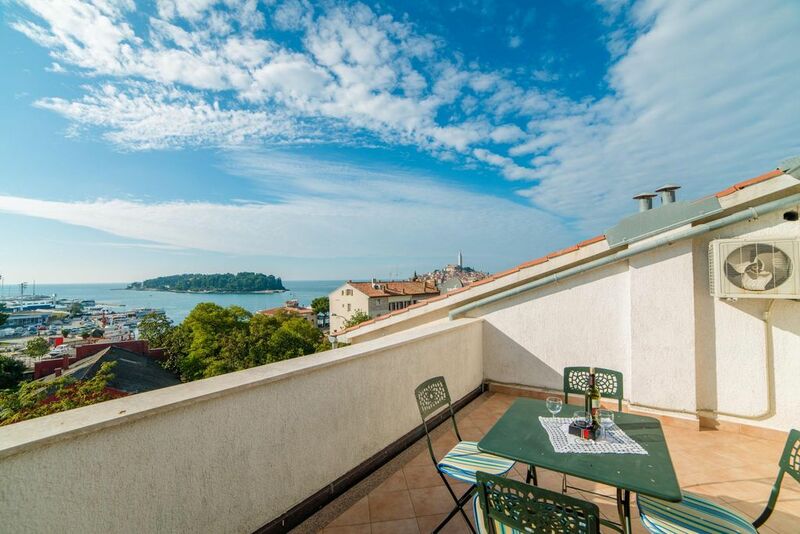 The property is located on the third floor and has a spacious terrace with sea view and view of the old town of Rovinj. The apartment consists of two bedrooms (one is with double bed and another one with two single beds), living room with sofa bed. Fully equipped kitchen has all necessary cooking facilities, microwave oven, toaster, fridge, coffee machine and dining area. The bathroom features shower and wc. Comfortable air-conditioned apartment is equipped with sat tv, free wi-fi, washing machine. Pets are allowed on request.